SHARING CREATIVITY and COMPANY: Happy St. Patrick's Day! Happy St. Patrick's Day! My demonstrator group did a swap where the predominant color had to be green. We got many different projects which I'll be sharing this month. 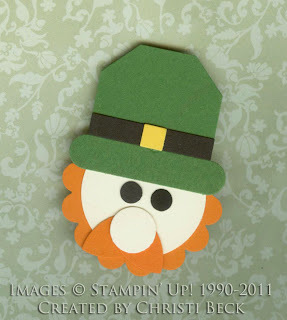 I thought I would share some of the St. Patrick's Day items to help celebrate today. This card was made by Cindy Peterson. It's a beautiful card. What you can't see is the light champagne shimmer on the card. Cindy mixed some champagne mist shimmer paint with hair spray and spritzed it all over the card. Great job, Cindy! At our demonstrator meeting, Christi Beck gave each of us this little leprechaun pin. If you see me today, I'll be wearing it on my jacket. He's such a cute little guy. Thank you for the gift, Christi! 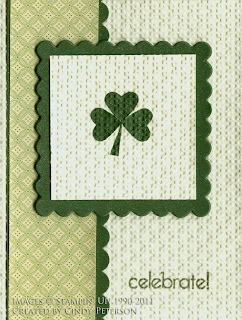 To see some other St. Patrick's Day projects, please go to my Facebook page. You can find me at Sharon Cheng, Independent Stampin' Up! Demonstrator.